Thank you for participating in the Relay for life fund raiser. This page was created for Melissa Lillard for her team Heart & Sole to help raise money for her cause. Part of every sale will go directly to her charity. Please Note: These are the only items that will be included in the charity drive. If you wish to order any other items, the sales will not go to the relay because they are not included for the fundraiser. Order Deadline June 4th, 2014. Below are the links to each type of product. You will be able to choose your scent on the order page. Click here to order a flowerpot container: this cute little flowerpot can be used for a tealight or votive candle. They also make a cute decorator piece. You can choose your color combo on the order page. Click here to order a vase: These vases are 9 inches tall and 3 inches square. They are a beautiful addition to your home, and your flowers will look beautiful in them. Add a little white color to your water to make the colors pop! You can choose your color on the order page. 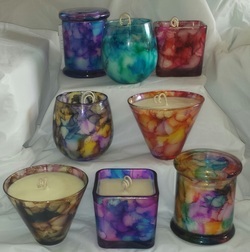 Click here to order a martini, wine, cylinder or square candle: These candles are made with 100% soy wax and natural oils. They will smell up a room without ever being lit. Each one of these holds appx. 10 - 12 ounces of wax and will burn for about 100 hours. Choose your color, shape and scent on the order page.